Man, pancakes are truly one of life's great pleasures. That might seem like a bit of an overstatement to you, but you haven't been eating any of the pancakes I have been making. I think I have finally mastered the art of the pancake. 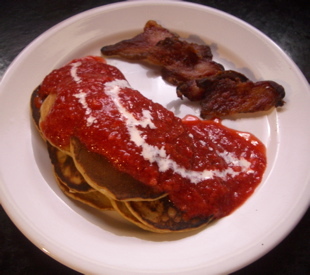 Two days ago I made pancakes with strawberry puree and a tablespoon or so of almond butter in the batter. I apologize for the lack of a picture because they were a lovely shade of pink. If they had been sweeter I could see a 5-8 year-old girl really liking them. But despite the lack of sweetness there was that pronounced floral flavor that good strawberries have. Silver dollars with molasses, nutmeg and peanut butter in the batter, with pureed strawberries(with tiny bit of balsamic vinegar added) and cream on top. I have trouble making pancakes these days without peanut or almond butter in them. I think the added texture and richness is nice, and I suppose I'm getting more protein as well. And that stuff on the side is some smoked jowl bacon. Now more on the bacon. Two nights ago I made an unreasonably complicated dinner, which is something I don't usually have anything against. But this one was too much. A BLT. 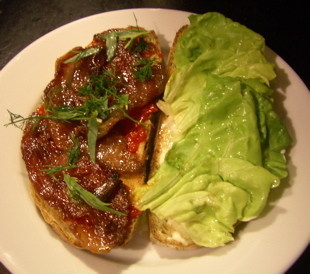 Smoked Jowl Bacon, Butter Lettuce, Caramelized Tomato Jam, Mayo, Tarragon and Dill on Toasted Semolina Bread. So more like a SJBLCTJTD. It was delicious. The tomato jam was very simple. I threw a handful of whole grape tomatoes into a pan with a tsp of olive oil and a tsp of chestnut honey. When the tomatoes started to brown and looked like they were going to explode, I took the pan off the heat and pureed the tomatoes with the immersion blender. Then I put it back on the heat, added a pinch of salt and a pinch of sugar, and cooked off the excess moisture. It was just enough for one sandwich. So maybe it wasn't so simple. 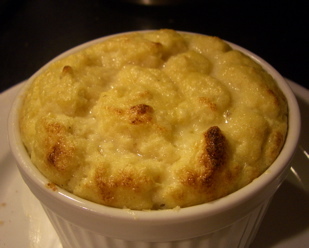 I will call it Failed Cauliflower Bloomsday Soufflé. 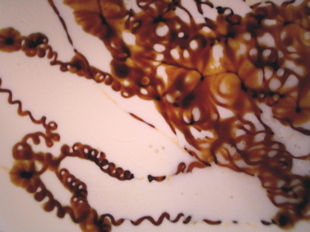 It needed more egg white for structure. But it tasted good. Cauliflower, sauteed shallots, some of the Bloomsday Anniversary cheese, and a pinch of cayenne.